One of the ways Anchorage Dental Care provides no-wait, efficient service to our patients is through the use of chair-side computers. 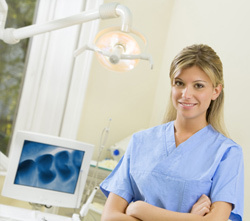 At Anchorage Dental Care, we believe that it is important to make full use of the latest technologies that can assist the staff and our patients in making educated decisions about their dental care. These technologies can also facilitate access to a patient’s most current information, digital images and X-rays to allow the appointment to progress smoothly and enhance the dental experience for the patient.